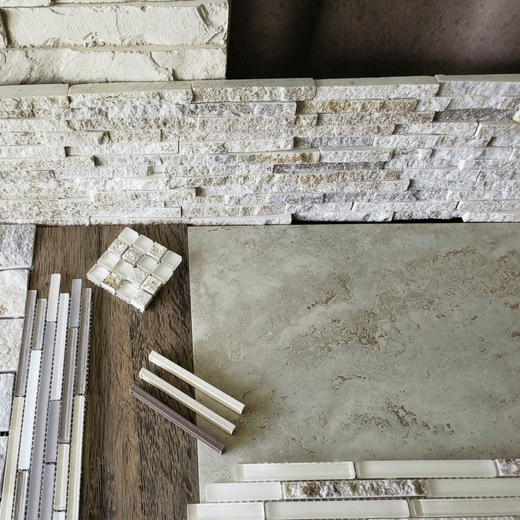 Our Materials Selection Service is for those who are in the beginning phase of a remodel or new build home. To save you time and money, we narrow down the choices based on your personal style, budget, lifestyle, and preferences. Each project is different and will require a different level of service. We want to ensure that the materials you choose will be right for you and will flow together with what is already in the home. In the case of a new build, we can begin from the outside with roofing and exterior materials to the inside with paint colors, flooring, and hardware that will give you a cohesive look from the beginning. Once you decide on a direction, we will begin sourcing and gathering samples for your approval. Then we will schedule meetings at the trade showrooms or bring the samples to you. As soon as everything is approved, you will receive a comprehensive list of all paint colors, tile, flooring, lighting, hardware, etc. You may share this list with your contractor for ordering the materials. The cost for this service begins at $1015 for one room and includes the two-hour Design Work Session. Additional rooms may be added for $115 per room. If you would like, we can make regular site visits once or twice a week to ensure that the correct materials are being installed. We can meet together on site to make decisions or discuss change orders. This is optional and is billed in advance for blocks of time in increments of five hours for $115 per hour.